Welcome to the first issue of Over the Weekend, a new weekly post that will wrap up the weekend's best concerts, compiled by your new fearless music leader and her band of freelance and staff writers. The overbooked springtime show season is in full swing, and this weekend kept our group of roving reporters hopping from club to club from the minute we got off work Friday into the early hours of Monday morning. Our writers caught a total of 11 bands at 6 different venues, including The Plastic Constellations, the Chuck D Fakebook, Sam Keenan, Kraftwerk and Rev. Horton Heat—and lived to tell about it. A rundown of the shows we saw this weekend, with excerpts and links to individual full-length reviews, begins after the jump. The 331 Club was packed for the Tuesday's Robot CD release show, and when I arrived crooner Gabe Barnett was finishing up an acoustic set and being drowned out by the chatty crowd. It was hard to tell at first whether people were there for the music or for the cheap beer and lack of cover charge, but when Tuesday's Robot launched into their first song the throngs of patrons pressed forward and hushed up for a set of jangly, Band-era rock tunes. Lead singer Rick Widen (who goes by Rick Robot on stage) was sporting a blue bandanna and a huge grin, and their set gave off a happy, hippie-love vibe. Widen runs a loose ship, coaxing plunking piano parts and piecemeal drum fills out of his band of free-wheeling musicians. The group left a little to be desired in terms of a refined or polished sound, but Tuesday's Robot served their purpose of warming up the busy little bar on a Friday night. At another CD release show across town, Sam Keenan blasted through almost every song off his debut album, All the Dark Colored Markers Went Dry. Though the songwriter and 89.3 The Current sound engineer admitted that he was nervous prior to his set, any anxiety he had about performing was indistinguishable from the audience once he started to play. Keenan crafts a delicate style of pop that relies heavily on the addition off-kilter organ parts and quirky electronic dabblings, and his songwriting showcases a penchant for hooks and sarcastic lyrics. My favorite part of Keenan's music is his voice: syrupy sweet and breathless, its steadfast nature contrasts sharply with his erratic music, conjuring images of a lounge singer trapped in an opium den with only a pack of Crayola washable markers as protection. Keenan's new album has been in heavy rotation in my stereo since I picked up a copy at the show, and the clean production and catchy melodies beg multiple listens and late-night singalongs. Halfway through the Rev. Horton Heat's set at First Avenue Sunday night, I found myself wondering: when did the Sultan of Psychobilly turn into an elder statesman of rock n' roll? He played "Greensleeves." He covered one tune representing each decade from the 1940s to the 1990s (Nirvana's "In Bloom" was a crowd favorite, as was Black Sabbath's "Paranoid"). He made terrible puns about serfs, and promoted an anti-malaria charity. Where was the lunacy? The beer-soaked, surf-inflected rockabilly red meat? Oh, it was there, too. The visual spectacle of the Rev's red blazer and Jimbo's upright bass acrobatics paled in comparison to the searing guitar sounds of songs like "Wiggle Stick" and "Baddest of the Bad." But all the old favorites were on display, from the cocktail cool of "It's Martini Time" to the classic fractured fable "Bales of Cocaine." And he tore the head off of "Psychobilly Freakout" during the first encore, just to prove the crown of rock lunacy was still rightfully his. Rev, I never doubted you for a second. 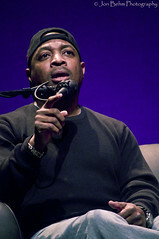 Excerpt: "Chuck D never performed Saturday--Slug and Ali freestyled together at the end with Chuck nodding along from his couch, his smile genuine and fatherly as Ali got the biggest cheers of the night with a line about representing Minnesota 'like Morris Day.' (Did Chuck's 'you can throw me a bone' remark--basically signaling his willingness to join in--get lost in the confusion?) But Chuck was the star of the show all night anyway. Mary Lucia seemed truly nervous for a change before her interview, and deferentially refrained from interrupting Chuck's rambles, which were long but very funny. Like the documentary, Lucia avoided controversy. She never brought up the overwhelming whiteness of Public Enemy's live audience, or of the one that night. Perhaps she, or her interviewee, were wary of a subject that can be (and no doubt has been) used to score cheap irony points against artist and audience both."